One of the main projects of the Finnish Institute in London this year has been the online gallery A Tale of Two Countries. In celebration of Finland’s centenary of independence, the gallery explores the shared history of Finland and Britain through curated pieces on cultural, political, social and personal history. The gallery preserves digital cultural heritage, inspires the further use of digital collections and invites everyone to share their memories and stories as part of the gallery. The gallery includes articles, images and both video and audio material. The online gallery was opened in June 2017. The first pieces included the story of Winston Churchill’s father’s fishing trips to Finland, rare images of Queen Elizabeth strolling in a Finnish forest with President Urho Kekkonen, and the digitalised version of the entire Kalevala, Finland’s national epic. More material has been added to the gallery throughout the past months, especially video interviews in which well-known Finns and Brits share their experiences of the two countries. Amongst them are ski jumper Eddie Edwards, cultural and political icon Jörn Donner, singer-songwriter Alma, television director Neil Hardwick and Members of the Finnish Parliament Pertti Salolainen and Maria Guzenina. Visitors have also shared their own memories of visiting, studying or working in Finland or Britain. One of the most extraordinary memories tells us the story about a man who volunteered alongside Finnish troops in the Finnish Winter War. The official launching events of the gallery were held both in Britain and in Finland in September 2017. 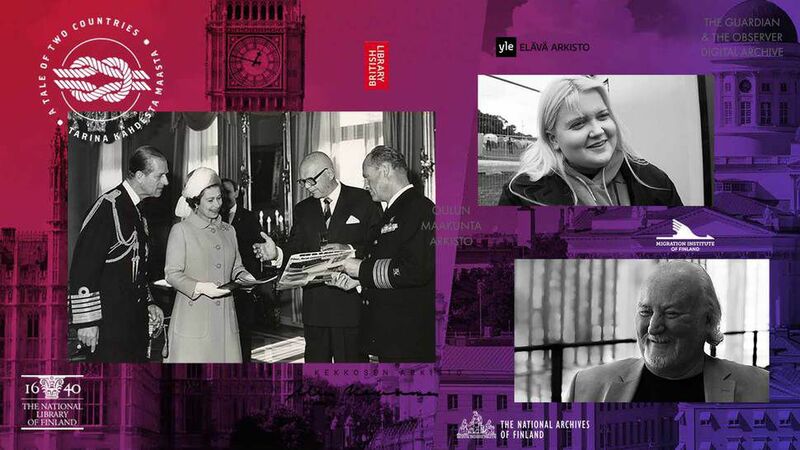 The British Embassy in Helsinki and the Finnish Ambassador's residence in London hosted the events, where visitors could learn more about the gallery and celebrate the wonderful contribution to digitalising the shared cultural heritage. Karen Bradley, the Secretary of State for Digital Culture, Media and Sport, shared her thoughts at the Helsinki launch: "A Tale of Two Countries is a fantastic digital project, where we are seeing online, free to access archive material showing the close relationship between the United Kingdom and Finland. It is a real honour to be here and it is amazing that we are doing this in the 100th anniversary of the country of Finland.” Karen Bradley’s video greeting can be viewed here. The materials have been gathered in close collaboration with The British Library, The National Archives of Finland and The National Library. In addition, several other archives, including those of The Guardian, The Observer, Yle Archives, Päivälehti, the Archives of President Urho Kekkonen and the Migration Institute of Finland, have also contributed to the project. The gallery will be maintained and new material will be added even after the centenary year of Finland’s independence. Please view the gallery and share your own stories and pictures here.